A coeducational, day and boarding, university preparatory school, Robert College is located on a sixty-five acre wooded area overlooking the Bosphorus. From a variety of places on campus, one can enjoy spectacular views of this unusually beautiful maritime thoroughfare. In the green oasis of its campus, the school is secluded from the fast-growing urban sprawl of Istanbul, yet the city center is easily accessible by bus, boat, or taxi. A majority of the classrooms, studios, offices and library-media center, as well as dormitories, occupy buildings constructed early in the century and bear the style and solidity of the era. They have all been renovated to meet contemporary needs. Founded in 1863 by two Americans, philanthropist Christopher Rhinelander Robert and Cyrus Hamlin, to offer an "American style" education under the Ottoman Empire, Robert College has been in operation longer than any other American-sponsored school outside the United States. The school and its sister institution, The American College for Girls (founded in 1871) have over the years educated many of Turkey's leading citizens since the Republic was founded in 1923, including two Prime Ministers, many cabinet-level ministers, ambassadors, and leaders in medicine, law, business and the arts. 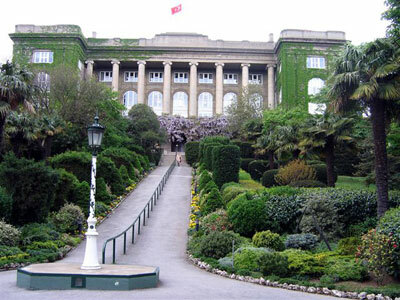 In 1971, the higher education division was transfered to the Turkish government and has continued as Boğaziçi University, Turkey's leading public university. The two secondary schools merged on the magnificent ACG campus, creating a coeducational day and boarding school which serves Turkish students who are admitted solely on the basis of performance on a national exam. The average students rank in the top 5 % on this exam required for admission to private schools. Thus, the intellectual ability of the student body is extraordinary. Unlike most international schools, the composition of the student body remains virtually stable. Almost all students who enter RC graduate from the school. Today, Rober College continues its educational life in Arnavutköy. The library-media center provides students and staff with materials for study, leisure, and personal growth. The collection includes more than 44,000 volumes in English, Turkish, French and German, as well as nearly 200 periodicals, and databases give access to thousands of newspaper and periodical articles in full text. The Computer center includes computer labs and maintains a school-wide network through which all students and faculty have internet access. In addition the main school buildings are all wireless and each faculty member is provided with a laptop computer. Some other technologies used in classes: Interactive white board, internet access, on-line attendance, films and videos. All classrooms and laboratories are equipped with permanent projectors. The Theater, with a seating capacity of 530 and professional-quality lighting and sound equipment, is the home of a very active drama program. Each year, at least a dozen performances in English,Turkish, French, and this year German as well, are presented by students and faculty. The facility is also used for school assemblies. There is also a well-equipped experimental theater, with a seating capacity of 180. Athletic facilities include a gymnasium (which accommodates basketball and volleyball), a fitness center, and a multi-purpose indoor court. Outdoor facilities include two playing fields, one with a running track, and four tennis courts. Faculty housing is located throughout the campus.